I provide CUSTOM Web Design at low prices, as well as Graphics, such as logos, My overhead is practically nil, and I am able to work one on one with you for a STRESS-FREE process. In the end, you have a beautiful, functional, SEO-optimized site for maximum business exposure. Custom WordPress design provides my clients with highly functional design coupled with the ability to self-manage updating of information for those who need this option. Or I can provide Webmaster services, which is the most popular option among my clients. Regardless, WordPress is the gold standard for highly functional, optimized sites today. I can also provide highly specialized design services so that your site is entirely unique. My designs are optimized (responsive design) to be viewed on PC, Phone or tablet equally well. These days, the majority of people are checking out sites on their phones and so my priority is to make your site highly functional on mobile devices. That means your mobile site leaves a good impression and provides all necessary information even if the visitor never sees it on their PC. When you choose my services, you don’t have to worry that you are getting in over your head. 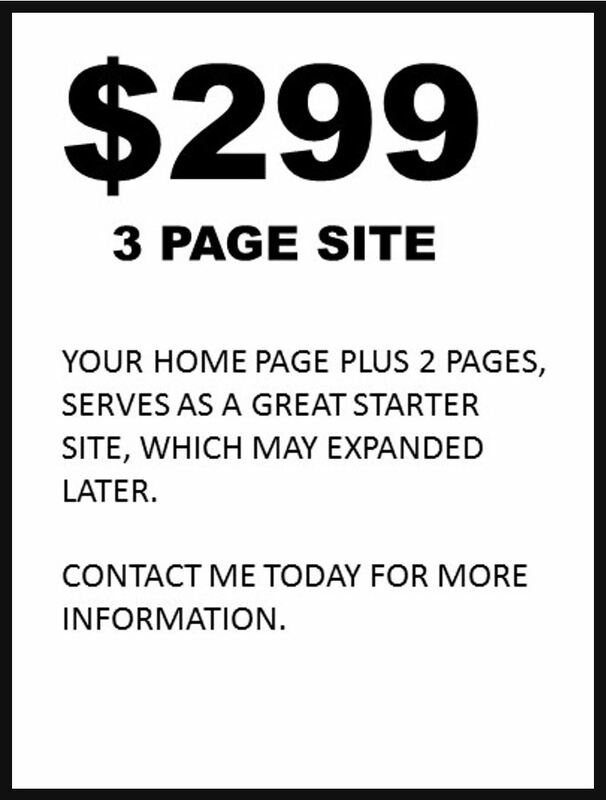 I will give you a reasonable quote up front, and no money changes hands until you approve the design and I begin finalizing coding and creating subpages. 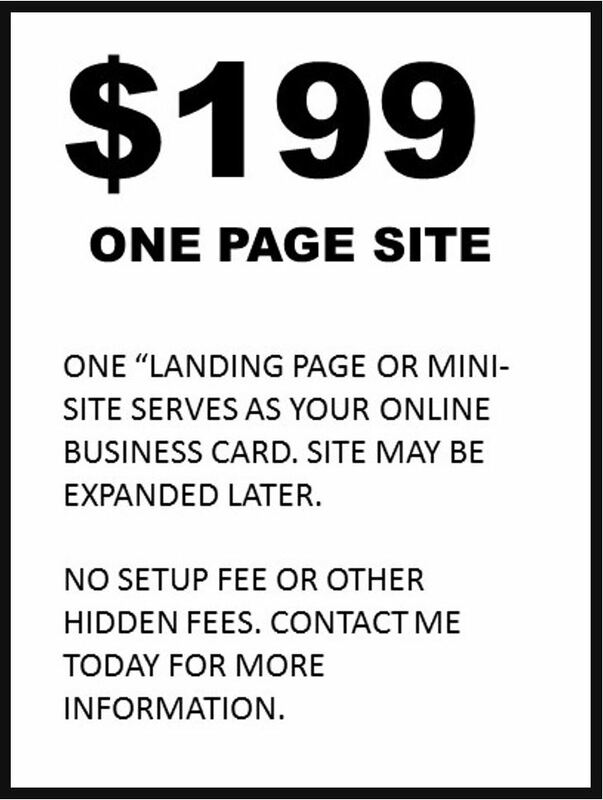 ALLOW ME TO WORK WITH YOU to make your site affordable. I am very flexible, offering payment options tailored to your specific needs. The ONLY CATCH: I only do family-friendly professional sites. Nothing illegal OR distasteful. Email or text me today for more information or a quote. My services are diverse, with more than 30 years experience in a variety of art and word-related fields, from newspaper design, publication and management to commercial and fine arts (visual), and web design. In the Webdesign field, I produce simple yet elegant brochure websites for small businesses, such as restaurants, photographers, retail and professional services. With these websites I can provide ongoing webmaster services. Because of the huge trend towards mobile usage, my priority (unless you ask otherwise) is to design your site to be vey simple and easy to use on mobile devices. In the graphic arts, I can design logos, and brochures, I enjoy producing bookcovers, e-book covers, poster work, and virtual cd and bookcovers. As a graduate of Ringling School of Art in Sarasota, Florida, I am trained in the fine arts of Painting, Drawing, and photography and have also completed many commercial art projects over the years. I have fine art in private collections in Georgia, Florida, South Carolina, and Arizona. My primary focus is oil painting, as well as pastels, pencil, charcoal and acrylics. In non-related areas, I am a musician and pastor. I guess you’d say I’m a Rennaisance Man. No job is too small or menial for me to consider and I would love the opportunity to work on your next project.